Deciding whether to medicate your child or not isn’t something you ever expect to have to do as a parent. There’s no mention of it in the how-to books you read. It’s not a decision you see people wrestling with in the tv soaps, or in films. But, about 6 years into my life of being a dad, it became a hotly debated topic in our lives. By that point Jude had been self-harming for about 2 years, and it was getting worse by the day. His meltdowns were getting more intense, and he spent the majority of his time on edge. He was constantly ready to explode. We felt like we’d tried everything, and whilst we’d see a short improvement at times, it would soon deteriorate again, and the self-harming would return, more intense than ever. So we began to discuss the option of medication with various doctors and professionals, and about 9 months later, after much soul searching, and questioning myself as a parent, we decided to give it a shot. The doctors decided Risperidone was the best choice for us to try first and we finally went for it. Knowing that you’re giving your 7-year-old son an anti-psychotic medicine was quite sobering. It really hit home just how desperate things had become. Well, mainly because we really weren’t sure if the medication was what was actually making a difference. Over those 2 years there has been some massive changes for Jude and for all of us. Jude has been increasingly happy and less anxious for over a year now. His behaviour has been more consistent, he seems much more in control of his emotions. And when I think about the medication, there are a number of other factors that have also been significant. Since July last year me and their mum have been living apart. This has meant Jude and Tommy now have two homes. Because they both need 1-1 care, and because Jude struggles so much around his brother, we look after one each and swap them around every couple of days. The difference this has made to Jude’s anxiety levels is incredible, if a little heart-breaking to admit. He no longer walks into the house anxious, mindful of where his brother might be. He knows that he is safe in that environment, and acts accordingly. There are no demands going to be placed on him that he is uncomfortable with. There’s no chance of anyone making loud noises, or trying to take his iPad away. Instead he’s able to feel like he is in control, and it shows. This boy who seemed so unsure of the world and all it presented to him, who seemed so uncomfortable in his own body, is now relaxed, and at ease with his surroundings. If he’s having a hard time he knows he can escape and be by himself. He has no worry of anyone disturbing him until he’s ready to rejoin me. For the first 4 years school was incredibly tough for Jude. 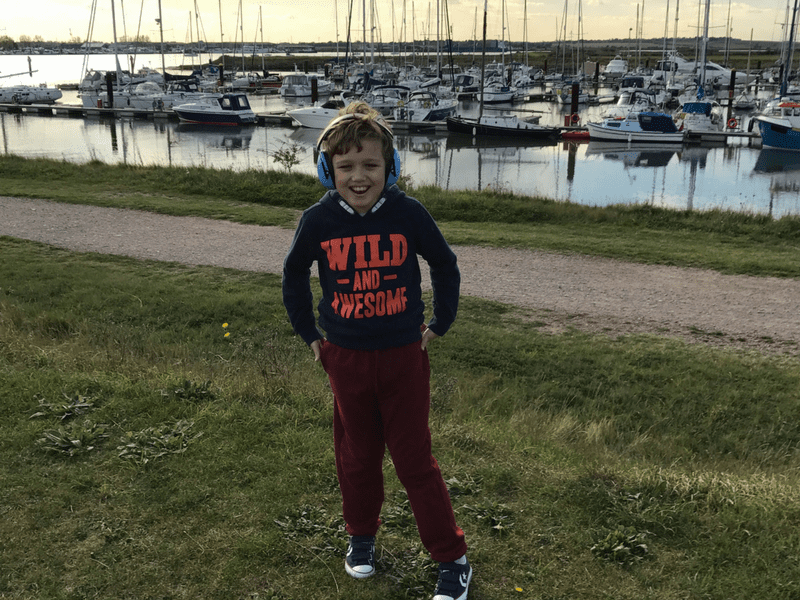 For someone who has never enjoyed being around other children, being in a classroom with other autistic children, who were loud and unpredictable, was incredibly hard for him to cope with. He would often self-harm at school, become aggressive and upset. When he returned home it would continue. Things became so bad that, despite how much we actually loved the school, we were looking at other options. We even considered home-schooling at one point. Then, last September, after a much improved summer of having the 1-1 alone time he needed at home, he changed class, and was around some different children. Ever since that day Jude has enjoyed school, and it’s made a tremendous difference to his life. School has changed so much for him that when he did have a bad day a couple of weeks ago, his teacher was in total shock as she’d never seen him so unhappy. What used to be a regular occurrence every day hadn’t happened in over a year! After years of late, sleepless, melatonin, and meltdown fuelled nights, Jude suddenly began to sleep better. Day by day he was going to sleep a little earlier, waking up less. When he did wake up it was for much shorter amounts of time. He started making the school bus in the mornings as he was able to get up early enough, having never made it more than a handful of occasions in the first 4 years. Having had a better night’s sleep has also improved his happiness (like it does for all of us!) Being less tired has meant he’s not as grumpy or touchy, more in control of his feelings. Taking all of this into account, we began to question whether the medication has actually been making any difference. After all, he’d been on the same dose of medication for nearly two years, but the improvements only really began to take shape about 10 months after that. Actually, that’s not fair. What we did notice when starting the medication was a reduction in how often and how violent the meltdowns were. This continued for a few months, but then Jude had a real regression and they became worse than ever before. So we watched and waited, unsure if the medication was doing anything, but too scared to upset this first prolonged happy period of Jude’s life. Aware that, as with all medications there are potential side effects for long-term use, a few months ago we began to discuss with his doctors weaning him off. As of a month ago, Jude is now medication free! At school he had a few rocky days, to the point where we were close to caving in and going straight back onto the medication. But just as quickly as it had started, Jude seemed to regain control and has been happy at school ever since. At home he’s been exactly the same, no noticeable difference in his mood or anxiety levels. Over the 4 weeks there’s been a couple of meltdowns, but nowhere near as intense or as long as they used to be. Jude has suddenly been going to sleep much later, and we’re back to 1am bed-times. But that’s something we’ll just have to live with for now whilst we assess how he’s coping. It’s been 4 weeks now, and apart from being a bit sleep deprived, I think we’ve made the right decision. If things take a turn for the worse we can always start again, or look into alternatives with the doctors. But right now I believe (and hope) that won’t be the case. We took the decision to medicate our child as a last resort. At that time life seemed like it couldn’t get much worse for Jude. Did it actually work? Maybe it did, maybe it didn’t. All that matters is right now he seems to be on a good path, and we’ll keep doing everything we can to make sure that continues.